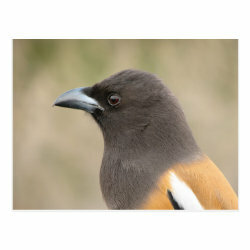 The Rufous Treepie is a beautiful species of corvid that lives in Southeast Asia, including the Indian Subcontinent. These colorful birds are in the same More... family as crows, ravens, and magpies. This photograph was taken on a safari in India. The gregarious bird landed on our jeep and we couldn't resist taking this portrait photo.